This post originally ran last year but we have an update for you! The folks over at The Blue Ridge Scenic Railway are giving away 4 tickets for a non-themed train ride during the the 2015 season! More details and contest entry are below. We enjoyed our experience so much that we immediately decided to make it an annual tradition and have already scheduled this year’s ride! 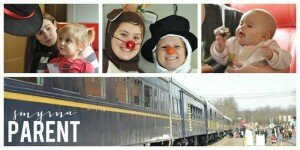 If you decide to take a ride on The Santa Express this year, post a comment and let us know what you think. This is not a news flash to this group, but Christmas with an almost-3 year old is fun. 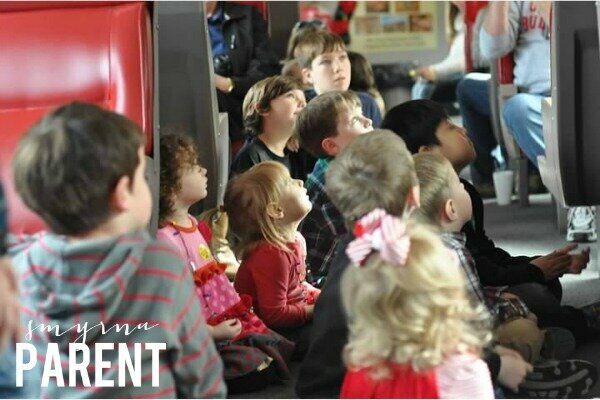 We’re trying to enjoy every minute, so when Jenn included several train rides in her Holiday Events post, we pretty much knew we had to make time for it. The train cars were decorated with garlands and wreaths. As soon as we sat (still panting), our toddler was given a train coloring book with crayons. We were also thrilled to learn that there was a concessions car only 2 cars from where we were seated – a life saver given that we had to miss lunch. Popcorn and dried fruit were the perfect way to hold everyone over for the hour-long trip. The train headed north towards Tennessee for 3o minutes and then simply returned back. There are no destinations on this particular trip, though there are longer options available where you have a 2 hour layover for lunch, shopping, etc. Shortly after we got started, Frosty, Rudolph and the Grinch entered the car and chatted and took pictures with all the kids. My daughter wasn’t sure what to think at first, but by the time they approached our seats she was warmed up and ready to chat with them. Their visit was followed by a story and then Christmas carols. About half way through “Here Comes Santa Claus” the main man showed up right on cue, with the Mrs. and an elf in tow. He gave the girls jingle bells and Mrs. Claus had candy canes to share too. He spent a very generous amount of time with each child allowing them to get through their wish list and take photos. My daughter asked for bouncy balls and dog bones for our dog. Santa raised his eyebrows at that short list, but assured us he can make it happen. As Santa moved on to the next car, we sat back, relaxed, and enjoyed our candy canes and the gorgeous scenery for the remainder of the ride. Despite the rocky start to the day, we are so glad we did it and plan on making it an annual tradition. Tickets are available for purchase here. The train rides often sell out, so check the site and buy in advance. 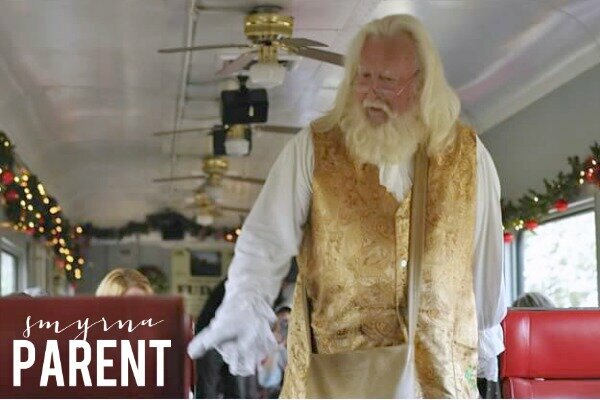 If the details of the Santa Express have piqued your interest about The Blue Ridge Scenic Railway, enter to win 4 tickets on a non-themed ride during the 2015 season! You will travel along the beautiful Toccoa River in your choice of vintage, climate controlled rail cars or open-air rail cars, arriving in the quaint sister towns of McCaysville, Georgia and Copperhill, Tennessee. You will have a 2 hour layover (1.5 hour layover on Sundays) with plenty of time to eat lunch, shop for unique crafts and antiques, snack on ice cream, or walk across the old bridge in town to view the river. Tickets not valid for the 2015 Fall Colors rides or the 2015 Christmas Rides. Winner will be given a contest letter with instructions on how to redeem tickets.